Master Box Dimension : 23" X 9" X 21"
Have your own set of toy mini golf carts! Set comes with 6 toy golf carts, 2 red carts, 2 blue carts, 2 white carts. Pull the carts backwards and watch them go. Carts are detailed from inside to out, and come with their own mini golf clubs. Golf clubs cannot be removed but they can move around in their bag. 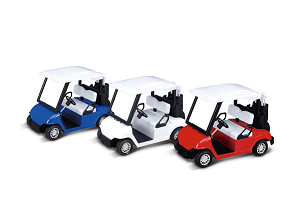 Mini golf cart set is great for decoration or play.